Everything in today’s era is about connecting and reaching out. 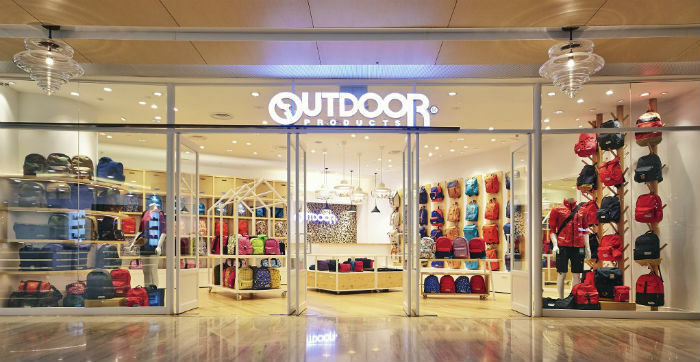 We are not talking about social or virtual media connections; but breaking the physical barrier between the consumers and the goods at a retail outlet. Fancy your product being on display 24/7, no extra promotion charges or display fee? You read that right. Let’s talk about Frameless Glass Shopfronts. Glass breaks the barriers between the interiors and exteriors of a place. Be it a shop, cafe, or the façade of a mall, it helps attract potential customers through the day & night. Some of the best examples in Singapore are The Capitol Piazza and the Marina Bay Sands. Visibility: 100% visibility encourages display of goods at all times. A view into the interiors of a shop invites potential customers. Consumers can window shop for more than just the display items at the front. Attraction: Frameless Glass doors provide for a splendid and uninterrupted view. It gives the shop premises a contemporary and elegant appearance and increases the external beauty. Low Maintenance: Glass is a clear object; and resilient to weather conditions and corrosion. It is stain free therefore can be cleaned easily, thus playing catalyst in displaying, an advertising tool. Durability: the thickness of a typical Glass shopfront can start from 12mm onwards until 21mm giving it an edge over the general glass displays. Practically unbreakable, when installed properly, it can last a lifetime. Security: Providing 100% visibility deters criminal acts. Sensors and locks fitted in the clamps and panel fittings of the toughened glass, give added security contributing to the benefits on installing Glass Shopfronts. Hinged Single Door: The most traditional option, with a swiveling hinge on one side of the door frame enabling the other side of the door to swing open from the wall.It can open inwards, outwards or both. French Sliding Door: A pair of single hinged doors that open/slide away from each other. They provide an elegant change from the outside to the inside. Sliding Doors: Sliding glass doors open sideways rather than inwards or outwards, gliding alongside the glass panel. Allowing for expansive glass walls to maximize the view. Folding Doors: Made up of a series of individual folding door panels, with either two or more hinged panels that fold along a sill track, and can be pushed to either sides of the opening. They help create the illusion of a larger interior, as the openings does not have obstructive structural posts. 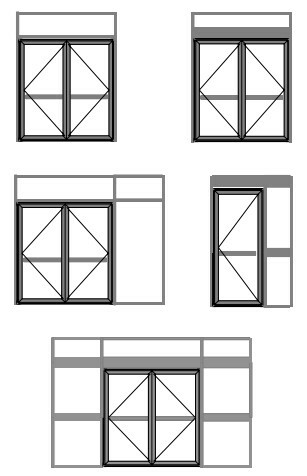 Pivot Door: Hinges are mounted at the top and bottom of the door, often at a center or off-center point. This means that when the door is open, it is both inside and outside. Generally bigger and heavier than single or sliding glass panels, the opening space can be wider than a single door. Patch fittings: They can be concealed within the floor or kept visible at the extreme sides, center or off-center. It is an ideal way to maintain elegance while ensuring security and ease of opening. 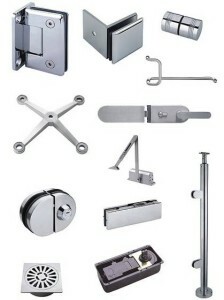 Door Closers: A wide-ranging variety of glass clamps to suit your needs. It is an easy automatic open technology. Locks are fit at the ends of the glass doors to keep the view unobstructed. Locks: Mechanical, electrical and access controlled locks are the ideal choices for the security of your shop. Frameless Glass Shop Fronts are the most sought after these days and the help you increase the visibility and outreach of your business. Break obstacles, install Glass, your business is just about to get bigger!